Listening to Seth Godin at PDF Conference on Friday, I was reminded again how good he is at cutting to the heart of the issue with great metaphors and images. In Seth's words: "Don't be a hunter, be a farmer." Old marketers behave as hunters with their sights on unsuspecting me. New marketers behave as farmers, focusing on sustainability, feeding, attention and care. 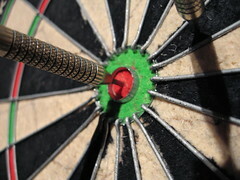 I don't like feeling like I have a bulls eye on my back - do you? Photo originally uploaded by Gare and Kitty. Exactly. Seth is a great storyteller. I agree 100% with the concept. If you are not a target what are marketers to call you? A crop, seed, or species? Seedling...gotta nurture me. Seriously - a person that owes them nothing. Problem is I am not something to catch and kill.